Modula’s automated storage and retrieval solutions are designed to optimise space and improve your picking and storage operations. Modula’s products help your company to recover up to 90% of valuable floor space while improving picking accuracy, increasing productivity and enhancing security. The Vertical Lift Module (VLM) utilises the full ceiling height of your facility thereby maximising the storage potential. Items are stored in systems up to 14.1 m high, in a safe, secure environment and automatically delivered to the operator, avoiding unnecessary walking, bending and stretching. 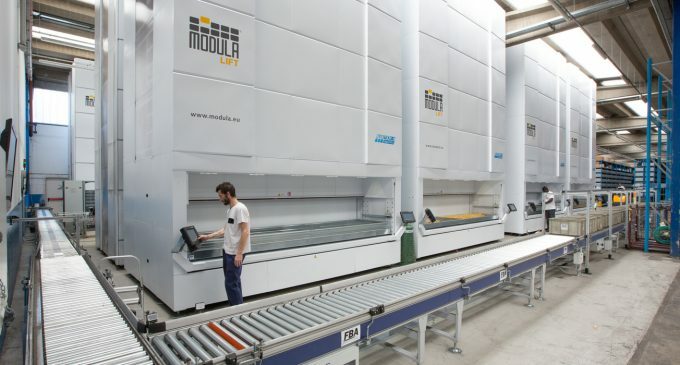 Modula offers one of the most advanced picking systems in the (VLM) market. It is possible to combine Modula’s industry exclusive external dual delivery picking bay with any one of Modula`s pick to light systems, for example our laser pointer system pinpoints the SKU by mapping it on an X,Y axis. The result is an increase in picking rates and pick accuracy along with higher productivity for operators between tray deliveries. All of this is combined with the highest tray load capacities, up to 990kg, and very fast pick cycle times. Part of the automation specialist System Group, we provide high density, cost saving storage solutions from 58 locations worldwide. Offering a consultative approach, we work closely with our customers to provide one of the most cost effective and innovative solutions. If you have a requirement to save space, save time and save money then why not contact Modula for a free survey and consultation?